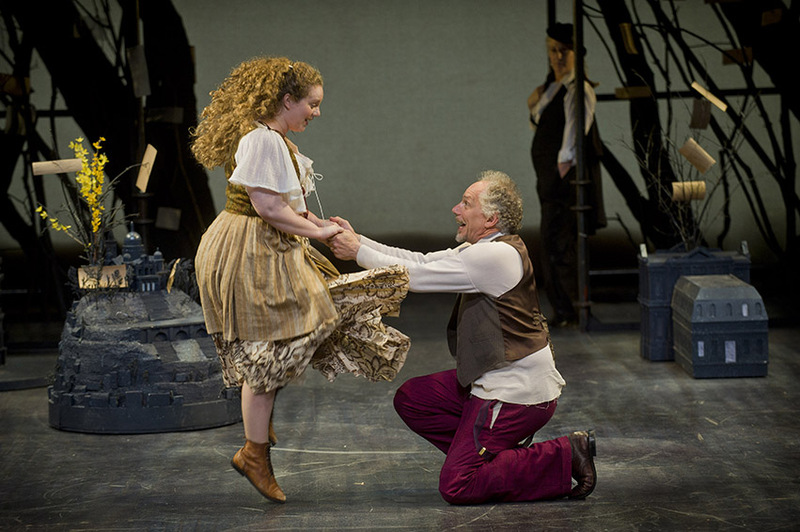 The audience at Shakespeare & Company certainly likes it very much – “As You Like It,” that is. This is of Shakepeare’s best known comedies with characters, script, and length which make it accessible to those who might feel terrified by anything written in the 16th century. As is typical of the Bard, the central story unfolds (along with secondary plots) to eventually weave the stories together into one happy ending. That is not a “spoiler alert,” since everyone knows that these comedies end with kisses and promises of a joyous future. They also include major elements: disguise, mistaken identity, banishment, love at first sight, a fool, country bumpkins, dukes, a palace, usually a forest, and our hero and heroine. In the case of this troupe, double and triple roles are the norm. Yet, audiences are never mistaken as to which character is acted at the time. Director Tony Simotes takes on double duty, not only at the helm of “As,” but other plays at this venue which perform in repertory. Simotes is a master at executing comedic timing. While slapstick abounds, it is the characters and their relationships that are paramount, and from these come laughter. Simotes has a dream cast, with Merritt Janson in the lead role. This actress has successfully portrayed dramatic characters in the past (Desdemona in “Othello”), but her forte is comedy. She creates a charming, intelligent, coy, witty, sad, and purposeful Roselind. Janson is surrounded by dream cast veterans Jonathan Epstein, Jonathan Croy, Johnny Lee Davenport, Malcolm Ingram; and newbies Jennie Jadow, Tony Roach, and Kevin O’Donnell. Credit must be given to the unseen players – the backstage folk who make it all look easy and flowing onstage. Founders Theatre stage is a long rectangle, so shaping a play has pluses and minuses. The set are numerous toy-size buildings, bridges, castles, etc. placed on the floor and moved about as the action moves. Certainly clever, the decision undoubtedly puts the focus on the people vs their surroundings. The costumes are a fun mix of 16th century, present day, and anytime. Music and full ensemble dance begin and end the play. “As You Like It" is very likable.